Flow of participants throughout the study. CBT indicates cognitive-behavioral therapy; DSM-IV, Diagnostic and Statistical Manual of Mental Disorders, Fourth Edition; PCI, psychiatric consultation intervention; SD, somatization disorder. Response rates as measured by improvement in Clinical Global Impression scale scores. Response was determined by a rating of much improved or very much improved by an independent evaluator. CBT indicates cognitive-behavioral therapy; PCI, psychiatric consultation intervention; SD, somatization disorder. Background Patients diagnosed as having somatization disorder (SD) who present with a lifetime history of multiple, medically unexplained physical symptoms represent a significant challenge to health care providers. To date, no psychotherapeutic or pharmacologic intervention has been found to produce clinically meaningful improvement in symptoms or functioning of patients with SD. We examined the efficacy of cognitive-behavioral therapy (CBT) for SD. Methods Eighty-four participants meeting criteria for SD were randomly assigned to 1 of 2 conditions: (1) standard medical care augmented by a psychiatric consultation intervention or (2) a 10-session, manualized, individually administered CBT regimen added to the psychiatric consultation intervention. Assessments were conducted at baseline and 3, 9, and 15 months after baseline. The primary outcome measure was the severity scale of the Clinical Global Impression Scale for Somatization Disorder (CGI-SD). Secondary outcome measures were responder status as determined by clinical ratings, self-reported measures of physical functioning and somatic symptoms, and health care utilization assessed via medical records. Results Fifteen months after baseline, somatization symptoms were significantly less severe in the group treated with CBT (0.84 points on the CGI-SD 7-point scale) (P<.001). Patients treated with CBT also were significantly more likely to be rated as either very much improved or much improved than patients treated with only augmented standard medical care (40% [n = 17] vs 5% [n = 2]). Cognitive-behavioral therapy was associated with greater improvements in self-reported functioning and somatic symptoms and a greater decrease in health care costs. Conclusion For patients diagnosed as having SD, CBT may produce clinical benefits beyond those that result from the current state-of-the-art treatment. We developed a psychosocial cognitive-behavioral therapy (CBT) for SD that is focused on stress management, activity regulation, emotional awareness, cognitive restructuring, and interpersonal communication.5,6 We hypothesized that CBT would ameliorate the symptoms of SD and decrease health care utilization beyond the effect of the current best medical care for the disorder. We conducted a randomized, controlled treatment trial in which patients diagnosed as having SD received 1 of 2 treatments: (1) our 10-session CBT added to the PCI (CBT+PCI) or (2) the PCI alone. In both treatment conditions, standard medical care was augmented by sending to patients' primary care physicians the psychiatric consultation letter used by Smith et al3 with minor modifications to make it applicable to our research environment. In applying the PCI to both treatment groups, the present study established a relatively conservative test of the CBT component's efficacy in that significant findings would be obtained only if CBT produced improvements over and above those resulting from PCI. Participants were randomly assigned to CBT+PCI or PCI using a computer-generated random number sequence. Neither blocking nor stratification was used. Study personnel conducting assessments were masked to participants' treatment condition and, hereafter, are referred to as independent evaluators. Men and women with multiple unexplained medical symptoms were recruited from medical clinics and through advertisements in the community. Interested potential participants gave oral informed consent to complete a telephone screening interview. Face-to-face diagnostic interviews were scheduled for patients who reported, during the telephone interview, current medical stability and 6 or more physical symptoms unexplained during previous medical treatment. Inclusion criteria were age 18 to 70 years, English fluency and literacy, a Diagnostic and Statistical Manual of Mental Disorders, Fourth Edition (DSM-IV) diagnosis of SD, and a Clinical Global Impression for Somatization Disorder (CGI-SD) severity score of 4 (moderate severity) or higher. Individuals manifesting any of the following were excluded: an unstable major medical condition, a medication regimen that had not been stable for at least 2 months prior to baseline, active suicidal ideation, a history of psychosis, or current psychoactive substance dependence. Women who were pregnant or attempting to conceive also were excluded from the study. Participation in psychotherapy concurrent with the period between the baseline and 3-month appointments was not permitted. The study took place in the Department of Psychiatry of the Robert Wood Johnson Medical School between September 1999 and April 2003. The study was approved by the institutional review board. Written informed consent was obtained from all participants. The PCI was applied to all participants in each group. A standardized consultation letter was sent to the principal treating physician of every study participant. This letter stated that the patient met DSM-IV criteria for SD and made recommendations for the patient's ongoing medical treatment (Table 1). Receipt of the letter was confirmed by 82 (98%) of the 84 physicians to whom it was sent. The CBT is a 10-session, manualized intervention expressly designed for patients with SD (Table 2). The treatment, developed by us, is described in a manual containing detailed guidelines for the conduct of each session.5,6 It was described to patients as an intervention designed to assist in coping with stress and physical discomfort. Four therapists, either master’s- or doctoral-level psychologists with at least 3 years of supervised training in CBT, conducted the treatment. All therapists received training in CBT for SD prior to treating a study participant. All treatment sessions were audiotaped. Throughout the study, each therapist received weekly supervision from 1 of us, during which the audiotapes of therapist's treatment sessions were reviewed. Treatment adherence and competence ratings were based on evaluations of taped sessions and were made routinely throughout the study. Study participants were assessed at a screening and a baseline appointment, which occurred 1 to 2 weeks apart, as well as immediately after the treatment phase of the study (ie, 3 months after baseline). Follow-up assessments were conducted 9 and 15 months after baseline. All independent evaluators were trained to administer the study's structured clinical interview instruments: the Structured Clinical Interview for DSM-IV Axis I Disorders (SCID)7 and the CGI-SD. To determine interrater reliability, assessment interviews were audiotaped and rated by an additional experienced evaluator. Interrater reliability was acceptable for the SCID somatization diagnoses (90.5% agreement between raters) and for the CGI-SD (intraclass correlation coefficient, 0.86). During the screening interview, the SCID was administered to determine diagnostic status and eligibility for inclusion in the study. The physician most central in the treatment of the patient's unexplained physical symptoms (usually the patient's primary care physician) was contacted by telephone to confirm the diagnosis of SD and of any comorbid medical condition. The study's primary outcome measure was an independent evaluator's judgment of the severity of somatization measured by the CGI-SD. The CGI-SD yields a composite symptom severity rating made by a trained rater after questioning the patient about the current frequency of, intensity of, and impairment caused by the 33 somatic symptoms that are assessed in assigning a DSM-IV diagnosis of somatization disorder. At baseline, the CGI-SD consists of 1 item, a global severity item. At the other 3 assessment sessions, the CGI-SD consists of 2 items, a severity and an improvement item. Severity is rated on a 7-point Likert-type scale ranging from 1 (no somatization) to 7 (very severe, among the most extreme cases of somatization). Improvement is rated on another 7-point Likert-type scale ranging from 1 (very much improved) to 7 (very much worse). Treatment response status was determined by transforming the 7-point CGI-SD improvement ratings to binary ratings. Patients who were rated as much improved or very much improved were considered to be treatment responders. All others were considered to be nonresponders. Health care utilization was assessed by examining participants' medical records. Patients were asked to sign a consent form allowing the research team to obtain from all insurance carriers and health care providers (physicians and nonphysicians, physical and mental health providers, and inpatient and outpatient facilities) documentation of all services and costs of services provided during the pretreatment year and the 15 months of the study. Once complete, participants' medical records provided the following data points for the year prior to study participation and for the year following the treatment phase: (1) total cost of health care services; (2) number of physician visits; (3) number of diagnostic procedures; (4) number of emergency department visits; and (5) number of hospitalization days. A potential mediator of therapeutic effects, patient expectations of improvement, was assessed. A standardized measure of therapy expectancies11 was completed by all patients 1 to 2 weeks after baseline and for CBT+PCI patients after the first therapy session. We also included an additional global expectancy-related item from the Treatment of Depression Collaborative Research Program.12 Participants received the expectancy questions by mail and mailed their completed questionnaire to the study office. Participants were informed that the treating clinician would not have access to data from this questionnaire. An intent-to-treat approach, based on data from all randomized participants, was used in all analyses. The CBT+PCI and PCI groups were compared at baseline and at 3, 9, and 15 months after baseline on the primary and secondary outcome variables. Differences between groups on baseline characteristics and on mediator variables were tested using unpaired t tests (for continuous variables) or χ2 tests (for categorical variables). Continuous data were analyzed using a mixed-model repeated measures analysis of variance. The model included the fixed effects of treatment (CBT+PCI vs PCI), time of assessment (baseline, 3 months, 9 months, and 15 months), and their interaction. In the mixed model analysis, the interaction between treatment and time was of primary interest. When the interaction was significant (P≤.05), planned contrasts determined whether changes in outcome measures observed in the CBT+PCI group (between baseline and each of the follow-up assessments) were different from those observed in the PCI group. Response to treatment (responder status), determined by the aforementioned binary transformation of the CGI-SD improvement scale, was analyzed using logistic regression to obtain odds ratios. For responder data only, missing data were imputed using last observation carried forward. Participants who failed to complete an assessment after baseline and who therefore were never rated on the CGI-SD improvement scale were considered to be nonresponders. Mann-Whitney U tests were performed on change in health care utilization between the year prior to baseline (ie, pretreatment) and the year following the 3-month assessment (ie, posttreatment). Analyses of health care utilization variables were conducted on only those participants for whom complete records of health care data were collected. To control for discrepancies in the pricing of health care services across providers and treatment facilities, we computed costs using a standardized cost structure, Medicare charges for specific units of care. Analyses using actual costs yielded the same results and therefore are not reported. All tests of statistical significance were 2-tailed and interpreted with a criterion of P<.05. All statistical analyses were performed using SAS, version 8 (SAS Institute Inc, Cary, NC). Figure 1 details study attrition. A total of 367 individuals complaining of multiple physical symptoms completed a telephone screening interview. One hundred forty-two (39%) reported at least 6 possibly unexplained physical symptoms during the telephone interview and agreed to participate in a face-to-face screening interview. Eighty-four individuals were enrolled in the study. Forty-three were randomized to the CBT+PCI regimen; 41 were randomized to the PCI regimen. Of the 43 patients randomized to CBT+PCI, most attended all of the 10 treatment sessions: 36 (84%) attended all 10 sessions, 3 (7%) attended 8 or 9 sessions, 1 (2%) attended 4 sessions, 2 (5%) attended 3 sessions, and 1 (2%) attended 2 sessions. Over the course of the 15-month study, attrition rates in the CBT+PCI and PCI regimens were low, and the difference in rates was not statistically significant (Figure 1). There were no significant differences in baseline characteristics between the 2 treatment groups (Table 3). Most participants were middle-aged women who had unexplained physical symptoms for an average of 25 years. 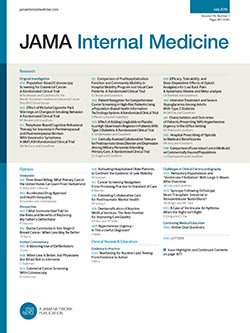 An examination of participants' referral sources revealed that 59 participants (70%) were recruited from health care practitioners (physician referrals) and 25 (30%) were recruited from public advertisements (self-referrals). No demographic or clinical differences were observed between physician referrals and self-referrals. The 2 treatment groups were not different in the proportion of physician referrals vs self-referrals. The mixed-model repeated measures analysis of variance on the primary outcome measure, CGI-SD severity, resulted in statistically significant effects for the treatment-by-time interaction (P<.001) (Table 4). Planned contrasts revealed significantly greater reductions in CGI-SD severity scores for CBT+PCI participants than for PCI participants between baseline and each of the follow-up evaluations. A supplementary analysis that did not presume that an interval scale underlies CGI-SD severity scores was performed. The convex hull test, a nonlinear rank test,13 was used to compare CGI-SD severity scores of the CBT+PCI and PCI groups. The CBT+PCI group demonstrated significantly greater improvement than the PCI group at the 3-month assessment (P<.001), the 9-month assessment (P<.001), and the 15-month assessment (P=.004). All parametric secondary end points were analyzed with the same mixed-model repeated measures analysis of variance, all of which resulted in significant treatment-by-time interactions (P≤.02) (Table 4). Planned contrasts on self-reported physical functioning (Medical Outcomes Study 36-Item Short-Form Health Survey) showed that CBT+PCI participants' scores improved significantly more than PCI participants' scores between baseline and each follow-up assessment. Planned contrasts on the Somatic Symptom Diary revealed greater decreases in somatic symptom severity for CBT+PCI than for PCI participants at each follow-up assessment. Similarly, for the Severity of Somatic Symptoms scale, planned contrasts showed greater reductions in retrospectively recorded somatic symptom severity at each follow-up assessment in favor of CBT+PCI. Responder analyses conducted on the CGI-SD improvement scale revealed that a significantly greater proportion of CBT+PCI participants were rated by an independent evaluator as much improved or very much improved at the 3-month (40% [n = 17] vs 7% [n = 3]; odds ratio [OR], 8.3; 95% confidence interval [CI], 2.2-31.2) (P = .002), 9-month (37% [n = 16] vs 5% [n = 2]; OR, 11.6; 95% CI, 2.5-54.4) (P = .002), and 15-month assessments (40% [n = 17] vs 5% [n = 2]; OR, 12.7; 95% CI, 2.7-59.9) (P = .002) compared with PCI participants (Figure 2). Complete health care records were obtained for 56 (68%) of the study sample. There were no differences in baseline demographic or clinical characteristics between participants for whom complete health care records were obtained and those for whom health care records were either unavailable or incomplete. Among participants with complete health care records, there were no differences on baseline demographic or clinical measures between participants in the CBT+PCI and PCI groups. Due to insufficient frequencies, further analyses were not conducted on emergency department visits or hospitalizations. Exploratory nonparametric tests were performed on the other measures of health care utilization. Mann-Whitney U tests revealed a greater reduction in total costs (P = .01) for CBT+PCI participants than for PCI participants. Between-group differences in favor of CBT+PCI approached significance on the number of physician visits (P = .07). The 2 groups did not differ in the number of diagnostic procedures conducted after the treatment phase of the study (Table 5). The 2 groups did not differ significantly on expectation of improvement. For 55 participants, independent evaluators professed not to be able to identify group assignment. For participants whose status independent evaluators professed to know, the evaluators correctly identified the treatment group for 17 of 29 participants (12 incorrect assignments). An index to assess the success of blinding14 was computed to be 0.85 (95% CI, 0.78-0.92). This index of blinding varies between 0 and 1, where 1 represents complete blinding and 0.5, the expected value of random guessing between 2 groups. The value of 0.85 would be considered a high degree of blindedness and statistically significant, given that 0.50 falls outside the confidence interval. Our data suggest that a 10-session CBT produces improvements in somatization symptoms and functioning over and above those obtained from PCI, the only established treatment for SD. Amelioration of symptoms was observed immediately after the intervention phase and persisted for 12 additional months. To our knowledge, our CBT regimen is the only individual psychotherapy to show efficacy in patients with SD in a methodologically adequate randomized controlled trial. The effect of CBT+PCI on SD was clinically significant and durable within the time frame studied. Effect sizes were in the range of other established psychotherapeutic treatments for other psychiatric disorders.15 The results provide preliminary evidence that our CBT-based psychosocial regimen provides benefits to individuals with SD beyond that generated by the most effective existing treatment for SD. Given the structure of the experimental design, however, we cannot conclude that CBT administered without PCI would be effective. The degree to which our treatment was effective due to factors specific to CBT, and theorized to underlie its efficacy, also cannot be answered here, given the limitations of the present experimental design. In this regard, however, it should be noted that patients' expectancies of improvement, often thought to be the causal mechanism underlying placebo and nonspecific effects of psychotherapy, were not different between the CBT+PCI and the PCI groups. Also, the therapeutic effects of CBT+PCI were not limited to patients' self-reports, but extended to clinical ratings and objective measures of health care utilization. The low patient attrition and high rates of therapy attendance, higher attendance than observed in other work with somatoform patients,16,17 may be important factors in the success of CBT, whatever the underlying mechanisms prove to be. This is a difficult population to engage and retain in a psychosocial treatment. This is the first study to our knowledge describing a psychosocial treatment that was acceptable to patients with SD, showed low attrition, and was associated with amelioration of pathology. The generalizability of our findings is limited because we did not treat a demographic cross-section of the US population or a randomly selected sample of patients with SD, but rather a group of SD patients willing to accept referral into a treatment study described as “stress management.” This study was conducted in a department of psychiatry clinic setting. Whether the treatment could be exported to primary care with the same retention rates and efficacy is currently being tested in our center. But the present findings, along with others indicating that CBT may be effective for less severe somatoform disorders,16,18,19 justify efforts to explore methods of encouraging patients and physicians to accept the potential utility of psychosocial interventions. The present study suggests that CBT may contribute to producing enduring, clinically meaningful benefits in patients with SD. Patients in the CBT+PCI group manifested a reduction in somatization symptoms and improved physical functioning. Preliminary evidence also suggests CBT+PCI may reduce these patients' overuse of medical services. Additional research is needed both to replicate our findings and to examine underlying cause-effect relationships. Future research should attempt to use more complex designs to systematically assess components of the CBT treatment regimen, compare the efficacy of CBT with that of alternative treatments, and determine whether therapeutic benefits extend longer than a year after treatment. Correspondence: Lesley A. Allen, PhD, Department of Psychiatry, University of Medicine and Dentistry of New Jersey, Robert Wood Johnson Medical School, 671 Hoes Ln, Piscataway, NJ 08854 (allenla@umdnj.edu). Accepted for Publication: April 10, 2006. Author Contributions: Dr Allen, as principal investigator, had full access to all data in this study and takes responsibility for the integrity of the data and accuracy of the data analysis. Funding/Support: This study was supported by research grants P20 MH074634, R21 MH066831, and K08 MH01662 from the National Institute of Mental Health. Role of the Sponsor: The sponsor played no role in the design or conduct of the study; in the collection, management, analysis, or interpretation of data; or in the preparation, review, or approval of the manuscript. Acknowledgment: We acknowledge the contributions made by Stacey Cahn, PhD, Melissa Warman, PhD, Laura Silberstein, MA, Katie Tobin, MS, and Jade Tiu, BA.